And here's a little sneak peek of one of the challenges we have planned for you! Make sure you plan some time to come and scrap with us on October 4th, we have a nice mix of seasonal and non-seasonal challenges in the works. Stay tuned for a sneak peek of our special SSZ Christmas Card Kits which will go up for sale the same day! 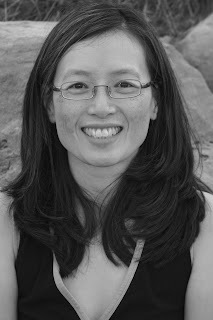 My name is Virginia Wong. 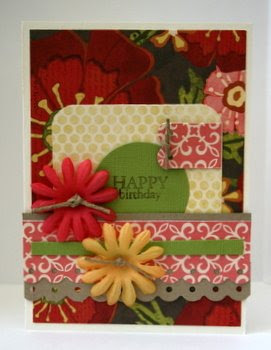 I have been a Creative Team member at Scrap Shotz since June 2008...and I have been having the time of my life here! I live near Scrap Shotz Headquarters with my two energetic daughters, Madison (8 yrs) and Danielle (4 yrs) and husband, Dominic...oh, and I cannot forget our bulimic fish, Goldie V! Onto a different topic now...today is the 25th of September and that means it is only a mere 3 months or 12 weeks from Christmas! Do you give handmade gifts? I personally love handmade gifts, be it a knitted scarf, a jar of jam or an adorable playdoh snowman. This year I am planning to make a variety of items such as a set of cards and year in review albums. But I don't want to be predictable and would like to shake up what I am giving so I went on a search. Have you seen Danielle Flander's blog? I think she has the right amount of charm, beauty, uniqueness and love with all her projects. Oh I would also like to share another fabulously talented lady that I take alot of inspiration from, Amy Butler! She is a designer of beautiful fabrics which feed my other passion, quilting, and has recently entered the world of scrapbooking with her equally luscious papers. Check out her blog here and all of her stunning projects. I am a colour fanatic and that with her amazing talent is what draws me to her blog over and over again. What do you think? And while you are scrapping away, it is nice to have a yummy meal cooking in the kitchen. Check out this blog, Rock Recipes. Every single photo makes my mouth water! And I cannot forget, one of my new favorite food blogs, Bake or Break. All I can say is yum-O! There is something in those photos that makes me want to break out the Kitchen-Aid! 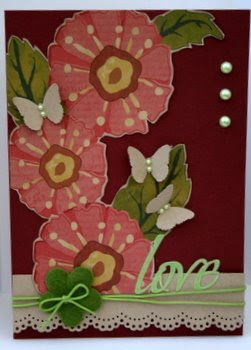 I hope I have given you some inspiration to create and I would love to see your creations in the Scrap Shotz gallery. And better yet, drop by our very friendly message boards - I would love to hear from you! Oh! Calgarians and surrounding area scrappers and cardies! Don't forget to drop by the Scrap Shotz booth at the Creative Stitches and Crafting Alive Show at the Round-Up Centre this Friday and Saturday, September 26 and 27, respectively to say "Hi!" It's gonna be a fabulous show and I can hardly wait to meet you! There was a great response to the blog candy giveaway!! I guess lots of you are interested in seeing the new AC cardstock (me included)!! 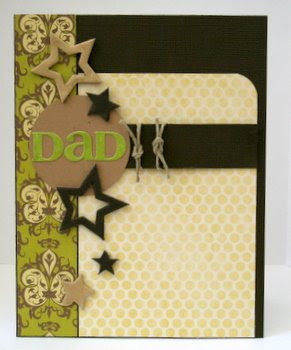 You can contact Sandy at Scrap Shotz to make arrangements for your awesome packs!! My pick this week is from the wonderfully talented Heather M...I love admiring her work! 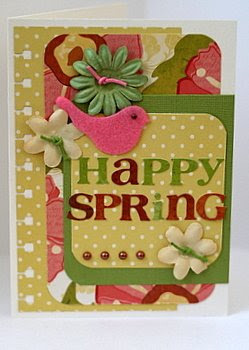 Please join Jess in the Scrap Shotz forums as she hosts our monthly Scrappy Hour. She is teaching a class on a Modified Flag Album. It's so cute. I just love it and I know you will too. Just click on the class title and join in the fun. Jess will be around for the next hour to help you through and answer any questions. While you are at Scrap Shotz, make sure you check out the reveal of the gorgeous October Kit October Days featuring the oh so yummy Daily Grind papers and embellishments from Fancy Pants. I will post links here as soon as they are up.. The addons are going up in the store as we speak too. This kit is so yummy. You won't be disappointed. Also, we salute a member of our "home" once a month in the Shotz Light. This month it is the very talented Kelly (KZ). Please check out the forum here to find out more about her. Here is one of her current favorite layouts. And lastly, stay tuned later as we draw the winners of the gorgeous AC Cardstock packs. Scrappy Hour is fast approaching. Don't forget to make sure you are here on Sunday Sept 21st at 8pm EST to join the lovely Jess as she hosts this months' Scrappy Hour. She has a wonderful project for you that I know you're gonna love. Jess has included a small supply list to help get you ready. And also for those "keeners" a little cheat to get you ahead in the game. Now for the cheaters... ...you'll need 28 pcs of CS cut to 3 1/8" X 2 3/8"
Also, don't forget that Sunday, the 21st is also the night for the October Kit Reveal, the add-ons go up, and there will be a new member highlighted in the Shotz Light. The winner of the awesome AC Cardstock blog candy will be named too. You never know, it could be you!!! There's lot of fun stuff happening. See you all on Sunday! To celebrate the launch of the new blog, Sandy has offered up some very cool blog candy. AC Cardstock features the 75 most classic and stylish colors, seemingly covering every shade and hue. The Cardstock is the heaviest weight available yet allows for flawless die cutting. Its classic weave texture is perfect for journaling and has a solid colored core that guarantees no white edges when folded or torn. It's available in both 12x12 and 8.5x11. Sandy has graciously offered up 2 packs of misc AC Cardstock. Each pack will contain 50 sheets of assorted colours and sizes. All you have to do is leave a comment on this blog post by 5pm EST on Sunday and we'll announce the winners during Scrappy Hour. A new feature of the Scrap Shotz blog is to have the Creative Team members join in on the blogging fun. We will try and keep you up to date on all the new products, techniques, and anything else scrappy. So, to start I thought since there are some new Creative Team members we should introduce ourselves so you can get to know us all a bit better. I'm Nonie and I've been a Creative Team member here at Scrap Shotz since October 2007. I live in Surrey, BC with my husband Allan, daughter Megan, dog Chloe, and cat Chevy. I've been scrapping since about 2005 and I love every minute of it. I love the creative outlet it provides me. Using all the beautiful papers and embellishments is the most fun part of it for me. And collecting all the beautiful papers and embellishements comes in a very close second. I'm so excited, I was finally published this year in the fall issue of Canadian Scrapbooker (pg 118). That was a real thrill for me. I'm hoping there will be more opportunities in my future. I love being on the Creative Team at Scrap Shotz. The members are so fun and friendly. It's a really great place to hang out. Scrapbooking has also given me the chance to explore my newest hobby of photography, which I'm really excited about. With all the new photographs I'm taking I've got lots of inspiration for my scrapbooking. If you are a photo buff or just like to admire them you have to check out this forum. Upload some of your photos, we'd love to see them. October 4th is World Card Making Day!! ... and we are having a little party!! Make sure you come by the forum that day because we are going to host a mini card online crop!! There will be fun challenges and more!! Plus we will be unveiling a seasonal special for our valued card-makers, trust me... you don't want to miss this! Yup, that's right. The "infamous" Scrap Shotz Online Crop is coming up next month. Make sure that your calendar is clear for the weekend of October 17th-19th!! You won't want to miss this crop. We're gonna Colour Your World!! Get ready for great challenges, games, make n takes and of course, great prizes!! This will also be the first crop for our new Creative Team members so there will be challenges galore!! Watch for coming sneak peaks in the next few weeks!!! for the reveal of the September Kits Take 2 and the September Card Kit. These kits are just gorgeous. They are limited edition kits and you don't require membership to purchase them. But, it's first come, first serve, so once they're gone, they're gone. So run to the Scrap Shotz store and check out these gorgeous kits. You can click on the photos of the kits in the sidebar to be taken directly to the store. The KT2 (Kits Take 2) called Pop Fashion features the fun new CHA release from Pink Paislee with the same name. With this kit you receive 5 patterned papers (including 2 scalloped), a matching transparency, rub on package and 4 coordinating Bazzill Cardstock. You also gett a package of MM just released new glittery alpha stickers in shimmery silver, 4 Bazzill Edges and 4 Doodlebug velvet brads. The last touch is a pink rhinestone flower, another new release! Our very talented Creative Team member Virginia had the pleasure of working with this kit for the reveal. Her layouts are stunning. See for yourself. Our Card Kit this month is called Scenic Sonoma and features the gorgeous Sonoma Line by Scenic Route. Included in this kit are 18 pieces of heavyweight 6x6 double-sided patterned papers (2 each of 9 designs). Along with the patterned papers, you will receive 6 6x6 sheets of assorted Scenic Route craft cardstock (some have designs). To embellish and add dimension to your card fronts, this kit includes a Daisy Bucket Leaf stamp set, 6 Bazzill blossoms, 14 assorted brads (including Doodlebug velvet brads), 8 Scenic Route chipboard buttons and finally 3 FULL yards of natural hemp twine. 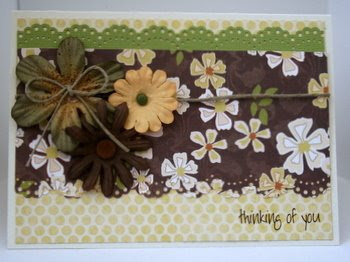 Lastly a sheet of Daisy Bucket word rub-ons is perfect for card sentiments. Jen, our Creative Team Administrator made some gorgeous cards with this kit. You absolutely won't believe how many you can get from this versatile kit. Check out the thread here in the forum for a showcase of all Jen's beautiful cards. This is just a sampling. Make sure you check back here often. There is so much happening at Scrap Shotz the next few weeks, you won't want to miss a thing. The first coming up is our Scrappy Hour on September 21, hosted by our lovely Creative Team Ambassador Jess. Stay tuned! Welcome to the new and improved Snap Shotz!! I'd like to thank Nonie for taking on the new look, and Julie for her work on our inital blog. You'll be seeing the new look and logo on our home page shortly. Besides revealing our new look blog, we wanted to send out a hello to our newest Design Team Members. Please welcome Laura Petley ( Laura), Cari Locken ( Cari L) and Amber Tosh ( AmberT). We'll be getting to know these girls, along with the rest of our team, in future blog features. The new Homepage is just about done, as many of you know we've had gallery issues, forum issues and other growing pains. Thanks for sticking with us as we transition into a new and much improved site. Check out the Design Team Challenge forum today for some more wonderful challenges to inspire your creativity. I can tell you that the challenges are super awesome!! Also, remember to come by later this evening at 8pm EST as we reveal the gorgeous September Card Kit featuring the beautiful Sonoma line from Scenic Route and the September Kits Take 2 with the uber cool Pink Paislee Pop Fashion line.